We know quality, comfort and energy savings are more important today than ever to home buyers. These days consumers are re-evaluating their lifestyles right down to the appliances and automobiles they buy. So, why not build the most energy-efficient home possible? By using less energy for heating, cooling, and water heating, our Energy Smart homes deliver approximately 35% savings on utility bills. Over the 7 to 8 years that a typical family lives in a home, you can save thousands of dollars. Comfort is ensured with consistent temperatures between and across rooms; indoor air quality is enhanced by reducing dust, pollen, bugs, and excessive humidity; and durability is improved with comprehensive water protection, windows that block damaging sunlight, and better grade equipment. 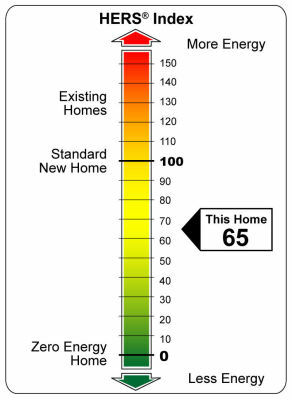 We have our new homes third party tested by a HERS Rater who will test the homes energy efficiency.